Carefully arranged, the house offers a living space of 40 m 2, with a terrace and views of the islands of Les Saintes. With breathtaking views of the sacred, the lodgings of 'nest Bellemont' are perfectly integrated into the landscape. From the top of the cliff, the visitor in search of scenery will find tranquility in a pleasant setting. He may discover a few steps le'Parc engraved rocks, remnants of pre-Columbian civilization or take the shuttle bus to the holy. Join the Grande Anse beach escape or hiking are a few activities to do nearby. Helen was a great host and we had an amazing stay at her place. Everything was prepared, clean and very comfortable. The view is amazing and Helene also surprised us with a dinner one night. We really felt like at home and would like to come back one day. I thank you for your appreciation, pleased that you have enjoyed our creole specialties as well as your stay. 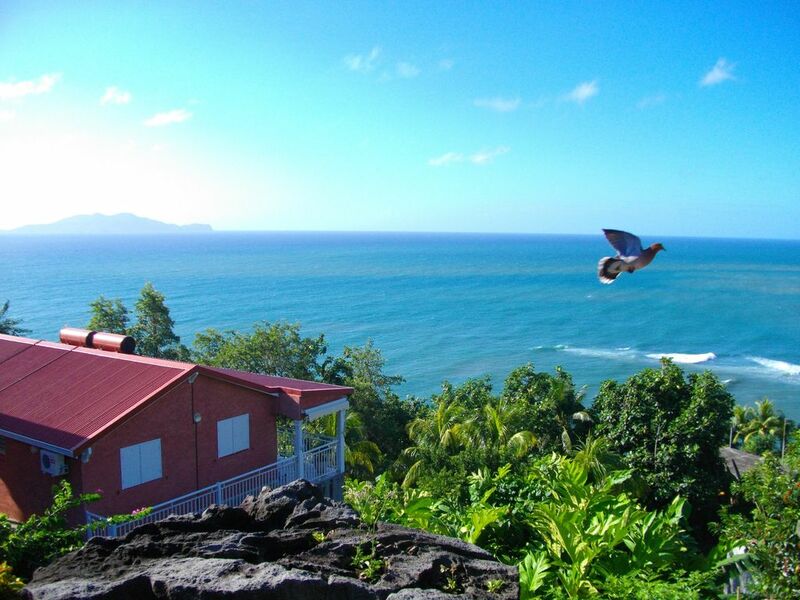 A slice of heaven on Basse-Terre Island! Hélène and Hénri were terrific hosts and their gítes in Trois Riviere was a perfect location to kick start our vacation. As hosts, they were beyond friendly and wanted to ensure that we had everything needed to enjoy our stay. The balcony provided amazing views of the ocean and mountainsides. We enjoyed leisurely mornings and relaxing evenings on the balcony listening to the birds, waves and frogs. The rest of the apartment is lovely and well equipped with the amenities needed for staying a few days. My partner and I would highly recommend this location for anyone thinking of staying on the south side of Basse-Terre. This is a well-equipped and comfortable place, one of three quiet units in a building separate from the owners' home. It has a marvelous patio overlooking the hills and the sea, and the sound of the birds (and goats) in the mornings and evenings is wonderful. It's in a nice neighborhood in Trois Rivieres, about a 15 minute walk or 5 minute drive up from the harbor. Helene and Harry are very welcoming hosts, and we enjoyed our stay very much. What a view we had from the balcony. This was what we enjoyed the most. Also the kind welcome we had from our hosts. We even had a special treat on our last night. So kind! We recommend these hosts and this place very much. Highly recommend Le Nid de Bellemont. Amazing! The apartment is lovely. It is in the perfect location, and it overlooks the water and some beautiful foliage. We sat on the balcony every night and watched the water and the stars and the amazing sunset. The apartment is well-equipped, clean, and comfortable. Be sure you are clear on where to park! Harry and Helene go out of their way to make their guests feel welcome. We enjoyed our stay very much, and would recommend this property to everyone, and we hope to return someday! Fantastic ocean view, clean, nicely decorated and gracious hosts Helene and Harry. Great location for access to ferry to Terre-de-Haut, volcano, Chutes du Carbet, Plage de Grand Anse, and hot spring baths. 'The Kilibri and Sikrie of' Nest Bellemont 'are two very pretty houses standing, between mountain and sea, in the charming village of Trois-Rivières, near the park of engraved rocks, the pier of Saintes, the Grande Anse beach and hiking trails. Tarif appliquée à la semaine,pour les nuitées nous contacter-Le montant de la caution est fonction de séjour.